There’s no such thing as a season for soup! I could eat soup all year around and I’m pretty sure if the wife would allow, I would. My grandma used to make huge pots of soup and we would freeze it and eat it for days and weeks. It was an event to walk in the door and be swept into a state of euphoria by the pot on the stove. Chicken Noodle, Split Pea, Chicken and Rice, Neck-bone Vegetable Soup, sooo good! If you have never had neck-bone soup, you haven’t lived. 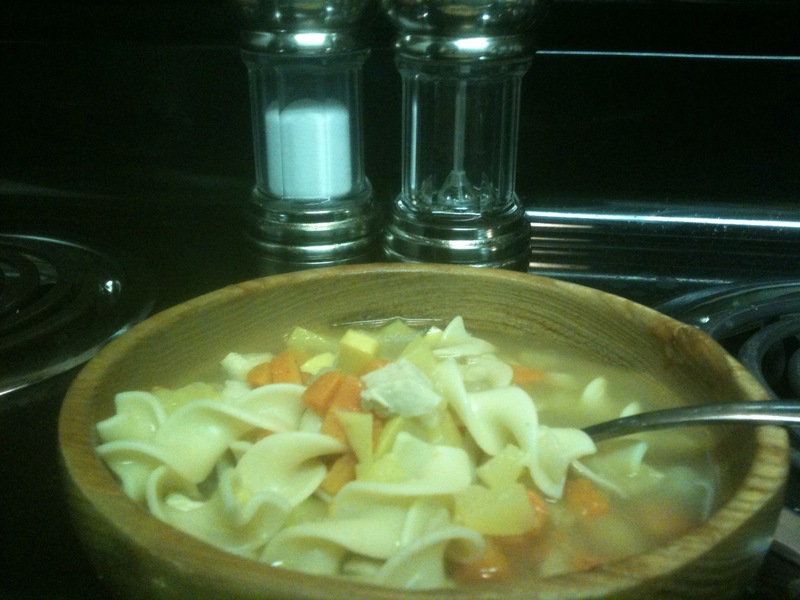 What I’ll be sharing with you today is one of my wife’s favorites, Hearty Chicken Noodle. This recipe can sometimes be tailored to fit her mood but here’s the standard version. This soup can be eaten anytime you desire but perfect for a rainy day. 1.Preheat oven to 375. Rinse chicken breast and season both sides with salt and pepper. Bake for 35 min or until an internal temp of 165 is reached. When chicken is done, set aside, allow to cool. al dente while others like them fluffy and soft. Drain noodles, rinse under cold water to stop cooking. Toss in a T. of vegetable oil and set aside. 2.Chop your first 4 ingredients in to a small dice or chunky if you so choose. But make sure all are the same size or cooking times will differ. Separate into 4 containers. Your going to sweat your onions (cook until transparent) for about 3 min. on med high heat. Then, add carrots and celery, saute for another 3 min. 3.Add your white wine and allow to reduce by half. Add your 3 cans of chicken stock and potatoes. Allow soup to come to a soft boil and cook until potatoes are tender. 4.Tear chicken in thin strips and add to base.Enjoy! 5.Now, I enjoy keeping my noodles separate from the soup. This way your noodles won’t get soggy and compromise the integrity of your soup before you can enjoy it the next day. I like to call this the soup without borders. This entry was posted in: Cook with Me! I totally agree with you about the soup. I love it all year round, especially chicken noodle like ths. I told my wife when we have kids. One day every couple of months,I’m going to make like three different huge pots of soup to freeze. Previous PostNY Pie…Start spreading the news! Next PostSweet Relief Bake Sale!…Come Eat for the Cause.